In the wake of the first ever Australian review of the risk posed to the country’s pollination and agricultural industries by large African hive beetle (LAHB), the pest is now endorsed as a High Priority Pest by all state, territory and federal governments. As part of a research project funded by the Honey Bee and Pollination Program, Professor Ben Oldroyd from the University of Sydney recommended that the biosecurity risk assessment for LAHB be changed from ‘medium risk’ to ‘high risk’. While the pest is yet to spread to Australia, the risk assessment identified the potential danger of importation of eggs, larvae or pupae in dung should be considered ‘medium’, and that the likelihood of establishment after importation is high. The likely economic impact of LAHB is also deemed ‘high’ in the research report. As a result of the review, Plant Health Australia prepared a support document reinforcing the review findings, which have now been agreed to by the National Bee Biosecurity Program Steering Committee and the Plant Health Committee. Chairman of the Honey Bee and Pollination Program Advisory Panel, Dr Michael Hornitzky, said the swift action of industry and government is testament to the quality of research being provided through the Program. “Only last year an ABARES report highlighted the increase in uptake of practice change in the Australian bee keeping sector as a direct response to research, and it’s encouraging to see that support exists at high level of policy making also,” Dr Hornitzky said. Plant Health Australia’s Horticultural Cropping National Manager, Alison Saunders, said the reassessment of the biosecurity threat is a positive step for the honey bee industry but also more broadly to pollinator reliant industries as well. “I think this demonstrates the strength and responsiveness of the biosecurity system when industry, researchers and government are working closely together to achieve the same goals,” Ms Saunders said. LAHB is a serious pest of honey bee colonies throughout southern and central Africa. 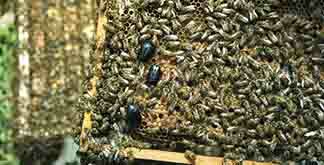 Adult beetles enter colonies where they feed on brood and pollen, causing significant damage. The Honey Bee and Pollination RD&E Program is a jointly funded partnership with the Rural Industries Research and Development Corporation (RIRDC), Horticulture Innovation Australia Limited (Hort Innovation) and the Australian Government Department of Agriculture and Water Resources. RIRDC funds are provided by honey industry levies matched by funds provided by the Australian Government. Hort Innovation funding is from the apple and pear, almond, avocado, cherry, dried prunes, summer fruit and onion levies and voluntary contributions from the melon and canned fruit industries. Levies are matched by funds from the Australian Government.